Double-click on the position in the "Open positions" tab. Right-click on the position in the "Open positions" tab and select "Close position" option from the context menu. "Close position" pop-up window will appear, where you can close your position or cancel it. As you can see in the above picture there is a Deviation option, which is intended to avoid requotes when closing a position during high volatility. You can also close a position by opening an opposite position with the same volume in the balance mode (without the "Lock" check-box ticked). In this case both positions are summed together, taking into account the directions of both. For example, you have a locked EURUSD Buy position with a volume of 10 000 and open a new unlocked (balance mode) EURUSD Sell position with a volume of 10 000, your positions will be closed. Moreover, if there are several positions with the same direction and you make a new deal in the balance mode - for summarizing, positions are selected in descending order of profitability. 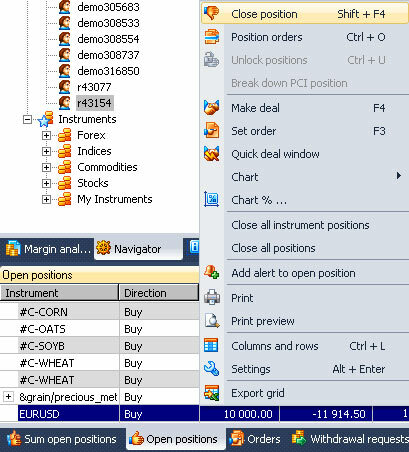 Close all positions of one instrument (for example, all EURUSD positions) by the “Close all instrument positions” option.